What if Kennedy Survived Dallas? If President John Kennedy had survived the ambush at Dealey Plaza in Dallas a half-century ago, what other twists might history have taken? 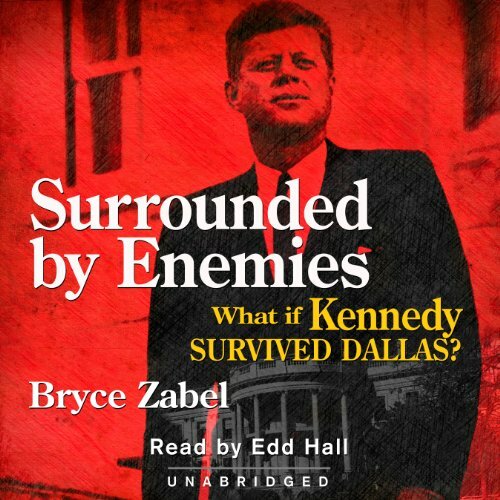 In his meticulously researched novel, Surrounded by Enemies: What If Kennedy Survived Dallas, author Bryce Zabel delivers a supercharged but plausible alternative narrative of the turbulent 1960s after our charismatic president escapes unscathed on November 22, 1963. Since the assassination, other writers have speculated about the important work for peace and equality that President Kennedy could have done had his life been spared. Instead, Zabel - a Writers Guild award-winning Hollywood writer/producer - boldly re-imagines a shocking post-1963 political scenario that is painfully disruptive to the nation, culminating in a Constitutional crisis and even calls for the president's impeachment. Without resorting to sci-fi gimmicks, Zabel instead investigates and explores what we now know about the underbelly of JFK's presidency to portray him returning to a very different Washington, D.C. where the stakes are high on so many fronts. After all, someone had just tried to execute him in broad daylight on a public street in front of a national television audience. The President and his brother, Attorney General Robert Kennedy, essentially become the first conspiracy theorists, determined to strike back at their formidable and determined enemies. This is not a time-travel story with a protagonist sent back to save JFK. It is not a rose-colored glasses look at an idealized "what if," Instead we get a hard look at the dark secrets of the Kennedy administration - and of those who have the motive and means to brutally remove him from office, including government insiders at the CIA, FBI, Secret Service and even suspects such as Vice President Lyndon Johnson. The provocative and compelling narrative covers the period from Kennedy's near-miss in Dallas through the subsequent political earthquake of 1964-1966. Zabel's novel is cleverly presented as a commemorative retrospective assembled by contemporaneous journalists on the staff of a fictitious newsmagazine, Top Story -- and incorporates into the narrative realistically designed faux-magazine covers depicting JFK with those luminaries he gets to meet only in Zabel's parallel universe. No, given all the other JFK related books, even Steven King's bizarre take on the subject, take this potentially meaty subject and really develop it. What was most disappointing about Bryce Zabel’s story? He didn't focus on any of the key subjects like Vietnam and Civil Rights that could have been so interesting to speculate on. Finally, in the last chapter, the pace quickens after the preceding majority of the books dwells on meaningless political speculation and scenarios. Do you think Surrounded by Enemies needs a follow-up book? Why or why not? YES! The world portrayed in this book diverges from ours 0n 11/22/63. (Please don't sue me, Steve). If JFK had lived, we would be living in a 2013 that none of us would recognize. Yet, the narrative includes the presidencies of Bill Clinton, Obama and paints Gary Hart as a player. There is no chance that these men would have played the same roles, in this fictional timeline, that they did in ours. Phillip Roth made the same mistake in his WWII book, in which Bobby Kennedy is killed exactly as he was in our world. In the situation that he describes, The Allies would have LOST the war. NYC would have stood in for Hiroshima and we'd all be wearing brown shirts. If you're going to write "alternate history", then make it frikkin' ALTERNATE!!!! Would you be willing to try another book from Bryce Zabel? Why or why not? Have you listened to any of Edd Hall’s other performances before? How does this one compare? Only if the chick playing Marilyn went full frontal. An odd form of Alternate History, but believable. Would you ever listen to anything by Bryce Zabel again? Who would you have cast as narrator instead of Edd Hall? Disappointment. The narration wasn't great, the idea is interesting though.